Organizing kids art supplies is such a battle! There are just SO many things. All. the. things. And they’re all different awkward shapes and sizes, not nice and uniform to fit neatly anywhere. There are long paintbrushes and pipe cleaners, thin markers and fat markers, awkwardly shaped paint bottles and that GIANT bottle of glue for the kids’ endless slime-making. And then there are the little craft supplies that need containers. Teeny tiny sequins, fuzzy pompoms, glitter that sticks to EVERYTHING. I’m admittedly a kids art supply hoarder. It’s all so colorful, fun, and creative, right?! But I’ve noticed… the more art supplies I buy, the messier our kids’ art supply storage gets, the less likely we are to even use it. 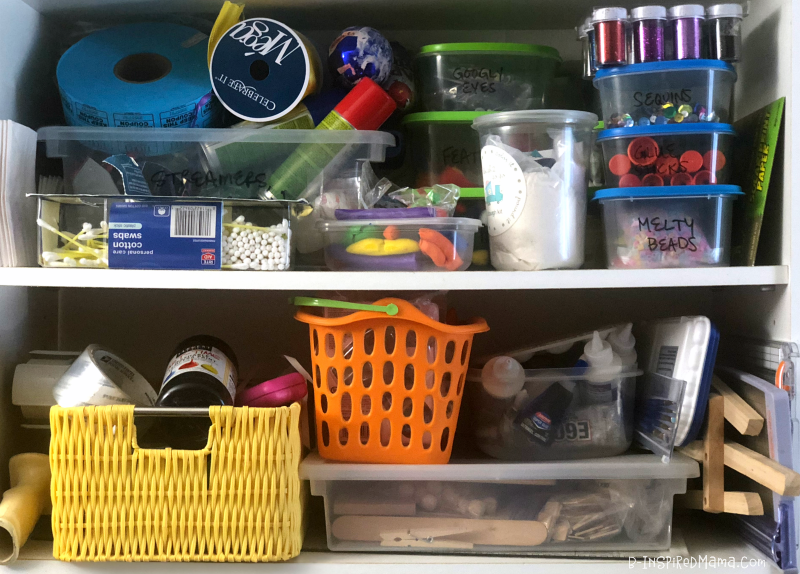 I’m embarrassed to admit… when the kids’ art and craft supply stash is unorganized and overwhelming, I tend to say “No.” instead of “Yes!” to the kids’ art project pleas. So when I was invited to try a new storage and organization solution from Duck Brand, I jumped all over it. Yes, please! This mama needs a kids’ art supply organization intervention! It’s Time to Conquer the Battle of Organizing Kids Art Supplies! I know it’s not so hard to organize art supplies into bins and containers. It’s the labeling of all those bins and containers that is a pain. And it feels nearly impossible to label in such a way that you can actually find what you need when you need it that’s the hard part. That’s the problem Duck Brand sought to solve. And they’ve definitely solved our storage and labeling challenges with their new Duck Pack & Track™ labeling system! 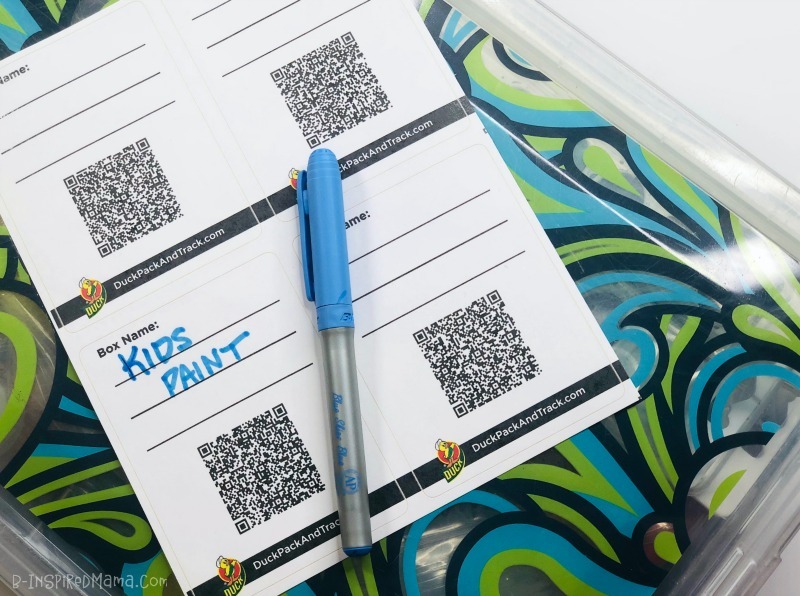 Duck Pack & Track™ is an innovative new app system using labels with QR codes to make your boxes (or art supply storage containers) and their contents (kids art supplies) scannable, searchable, and easier to keep track of! Of course, the obvious use would be for managing and tracking boxes during a stressful move. But I immediately saw the potential for this system to help me tame our crazy arts and crafts supply monster. 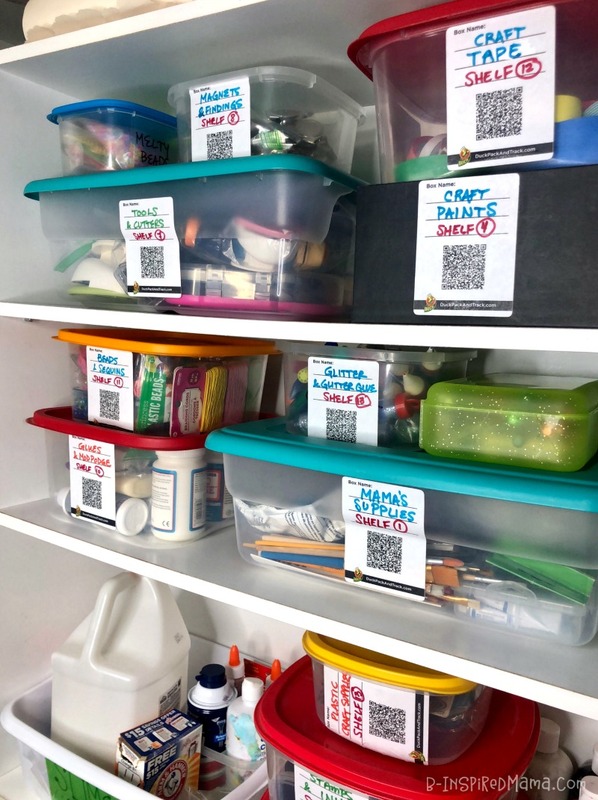 Create a searchable inventory within the Pack & Track™ app of your kids’ art and crafts supply storage containers, including each container’s location plus a list and/or photo of what’s inside. 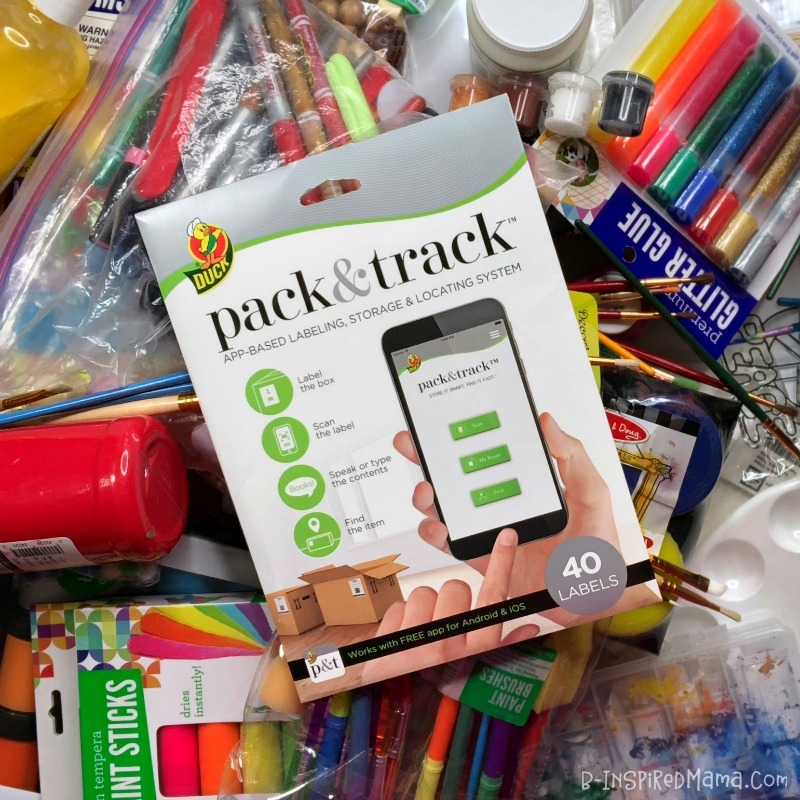 Use the “FIND” feature in the Pack & Track™ app to search for a specific kids’ art supply to find out exactly which container it’s in and where that container is located in your home. 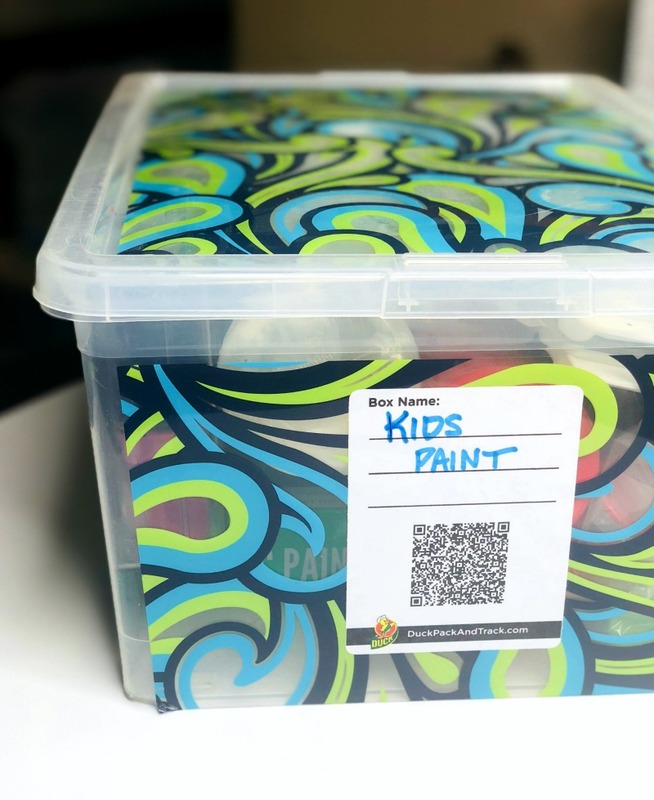 Use the “SCAN” button to scan the barcode on the Pack & Track™ label on an art supply storage container to see a list and/or photo of the kids’ art and craft supplies inside the container. See how it works! And check out the FAQs too. You’ll be able to quickly and easily grab the specific supplies needed for a kids art project. That means more “YES!”es when the kids want to be creative! You’ll be able to more easily plan fun art projects for the kids by seeing exactly what arts and crafts supplies you have to work with! You’ll have an inventory of your kids’ art supply stash right in your pocket or purse while shopping, so you won’t waste money on buying kids’ art supplies you already have! If you have a fairly small kids art supply collection, you might not have enough to group by type. You can instead just use 2 to 3 medium storage bins and NAME them “Kids Art Supplies 1”, “Kids Art Supplies 2”, etc. Short on time? Just use the app to scan the container, enter the container name & location in the app (using voice or keyboard), dump everything in the container out and arrange to make sure everything is visible, and photograph using the app. Put it in its location, and you’re DONE! If you want to, you can go back and add the list when you have more time. I plan to see how just using photos works before putting in that much effort! Ha! Get the kids organizing too! They can help sort supplies by type, arrange supplies so everything is visible for the photo, tell you all the supplies in the bin while you type them, or say the art supply names into the smartphone to use the voice feature, and carry containers to and from their locations. (That heavy work is great for their sensory system anyway!). Keep extras stored away, and refill an art cart as needed. We have a small home (1100 sq. ft. for our family of 5) with no room for an organized kids art room or playroom. So I set up a kids art supply cart for use at the dining room table. 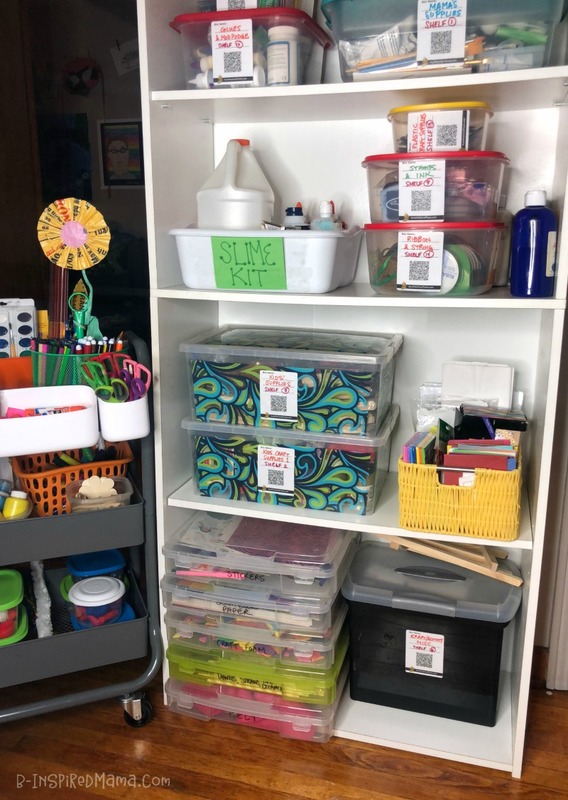 So they can (or mom can) wheel their art supply cart into the room where the kids’ art supplies are organized to replenish or rotate the supplies on the cart. And to store it away when we have company coming! Ready to Start Organizing Your Kids Art Supplies?! Ready to organizing kids art supplies with Duck Pack & Track™ too? 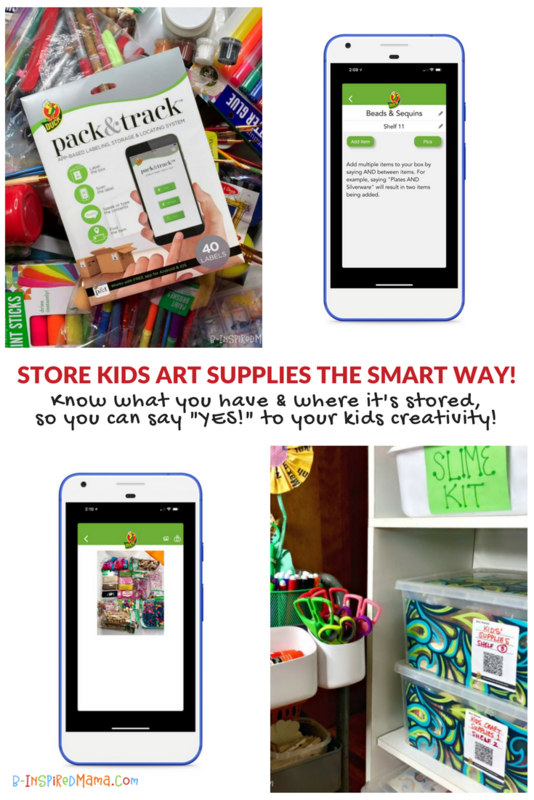 Grab your Duck Pack & Track™ kit from Walmart (available nationwide), then follow the simple steps on the package to download the app and get those kids art supplies organized! And then show us a photo of your complete art supply storage project on the B-Inspired Mama Facebook Page or share on Instagram and tag @BInspiredMama. I bet Duck Brand would love to see your photos on their Duck Brand Facebook Page or be tagged (@theduckbrand) in your Instagram post too! 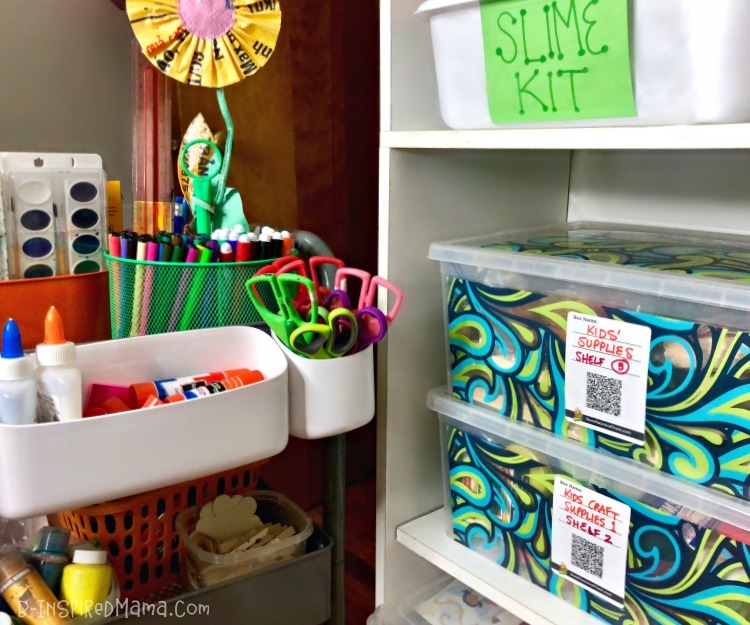 Like this Idea for Organizing Kids Art Supplies? Pin It & Share It! Just use one of the buttons at the top or bottom of this post to save this post and share it on social media. I’d really appreciate it! This is a sponsored post written by me on behalf of The Duck Brand for IZEA. All opinions are 100% mine. See my disclosure policy for more information.